Household and kitchen appliances get old. Sometimes they just need to be upgraded and other times they break down and must be replaced. Either way, you still have to get rid of the old one. Hauling off and disposing of old appliances is a difficult task for any homeowner. Unless you already have an appliance professional or two at home and a large truck, getting rid of that old machine is going to be a challenge. Some items you might find can take up a new home in your garage perhaps, like the refrigerator. But hardly anyone needs two dishwashers! And if the old one doesn't work, what do you do with it? Here are some tips to help you with that. Okay, let's assume that your old machine is still in working condition, but you simply wanted to upgrade to a newer, better machine. Maybe one to match the other new appliances you just put in your kitchen. Whatever the reason, you wouldn't want to simply dispose of a perfectly usable appliance. This is where you can make a little bit of pocket money while helping out someone who may not have the budget for a new machine. Yard sales or garage sales may be a bit of a stretch for finding buyers, but it's certainly worth a try. Various classifieds can work, and especially online services such as Craigslist. Remember to clean the machine and be sure to note any visible damage or scratches. If you post your appliance online, always include close-up and well-lit images. If selling it yourself is not your cup of tea, you can easily find used appliance dealers and "junk" dealers who would be happy to take your old machine off your hands for cash. Just don't expect to make a lot of money on an old appliance, however. Assuming again that your old machine is still usable, you can likely find any number of places that would take it as a donation. You can be a bit creative when donating and look beyond the typical charity thrift shops you might already be familiar with. Numbers of non-profit organizations have facilities that often include a kitchen or dining area. Maybe one of them could benefit from a "new" dishwasher? Missions, shelters, and other facilities might be good places to check before handing it over to the first Goodwill or Salvation Army store you find. Another option might be to ask around to see if anyone in your neighborhood could make use of a functioning dishwasher. Many older residents find themselves on fixed incomes and might be greatly benefited by having a labor saving appliance given to them. While it may tempting, you probably want to avoid simply dragging your old machine out to the sidewalk near your home and taping a sign on it that reads, "FREE" as this is not only a safety hazard for small children in the neighborhood, it may also be illegal depending on your city or county. If your machine is broken and beyond repair, then the first two tips won't really apply. However, there is still a better option than taking your dead dishwasher to the local landfill. In fact, that may not be an option depending on your location. However, dishwashers - like most household appliances - lend themselves quite well to being recycled. Once a dishwasher is dismantled, the bulk of it's components are metals that can be used for scrap metal. There will likely be a small amount of electronics that can also be recycled along with some of the other materials found in the motor and the hoses, etc. In fact, almost all of the bits and pieces that make up your old dishwasher can be effectively recycled or reused if properly processed. The key is making sure it gets taken to the right facility. And that's where getting a professional team to pick up and haul away your old machine comes in handy! 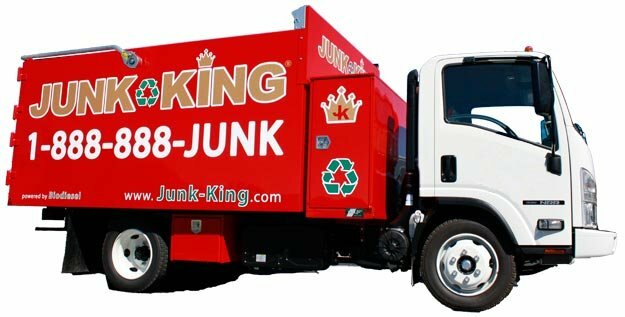 Junk King is the team to call for professional junk hauling services to remove refrigerators, freezers, ovens, stoves, flattops, dishwashers, ranges and more. We have all the equipment and staff to remove a large dishwasher out of your kitchen, through the house, and into our truck. Junk King will remove any household appliance that you don't want. Whether the appliance is broken, or you are just upgrading your kitchen, Junk King can help you get it out of the way. We provide an eco-friendly appliance removal service to help you get rid of any unwanted household appliances, or any heating and cooling equipment. Our professional and insured appliance disposal team will show up at your home and call 15 minutes before we arrive on site. Once there, we’ll give you a free estimate based on how much room your items take up in our truck. You point and we haul your old appliances into our junk removal trucks, with no hidden fees. It’s as simple as 1, 2, 3.